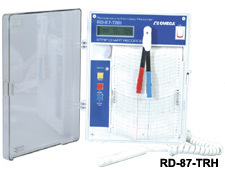 The OMEGA RD-87 Series strip chart recorders are offered in different models to record either a J Thermocouple, Temperature, Temperature/Humidity or a 4 to 20 mA input signal on a 100 mm wide strip chart, with a single pen. The temperature/humidity model uses two pens. Pens are colored to maximize chart readability. All RD-87 models offer a LCD display and user friendly controls. A full function alarm feature is provided on the RD-87 Series. The alarm can be set to sound an audible signal when the measured value(s) has exceeded an upper or lower limit. Each limit is individually set from the front panel. A delay time before the alarm is activated may be set by the user to prevent nuisance alarms caused by short-term variations. Low power normally open relay contacts are provided to allow activation of a remote alarm, phone dialer or annunciation. Power is supplied through a plug-in mains power adapter. External power may be supplied from any 12 Vdc source such as automotive, marine, or other battery. Battery backup for up to 48 hours is featured to provide operation during temporary power loss. Nota: Comes complete with one pen per channel, one roll metric paper, one roll standard paper, 120 V ac power adapter, and complete operator’s manual. RD-87-J includes a six foot beaded thermocouple wire. RD-87-TEMP includes 4 inch probe with 15 feet cable. RD-87-TRH includes a temperature/humidity probe with coiled cable. RD-87-VAC includes two sensor wires with banana plug and alligator clip. RD-87-CAC includes a clamp on current probe. To order unit for 220 Vac, add suffix “-220V” to model number. No additional charge.